The Atlantic salmon louse, Lepeophtheirus salmonis salmonis, is a small crustacean ecto-parasite belonging to the subclass of copepods found in marine waters in the Northern hemisphere. It is host specific to some of our well-known salmonid fishes such as the sea trout (Salmo trutta), rainbow trout (Onchorhynchus mykiss) and the Atlantic salmon (Salmo salar), where it feeds on the skin, mucus and blood from the fish. 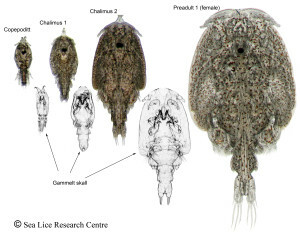 The life cycle of the salmon louse was first studied in the late `70ies and at that time, ten different developmental stages, that means different states of developmental divided by a moult, were believed to exist; nauplia I and II, copepodid, chalimus I, II, III and IV, pre-adult I and II and the adult stage. However, researchers at the SLRC in Bergen and collaborators have recently discovered that the formerly known four chalimi stages was in fact only two stages, chalimi I and II The life cycle of the salmon louse had to be re-written, and today, eight developmental stages of the louse are proven to exist thanks to this study. 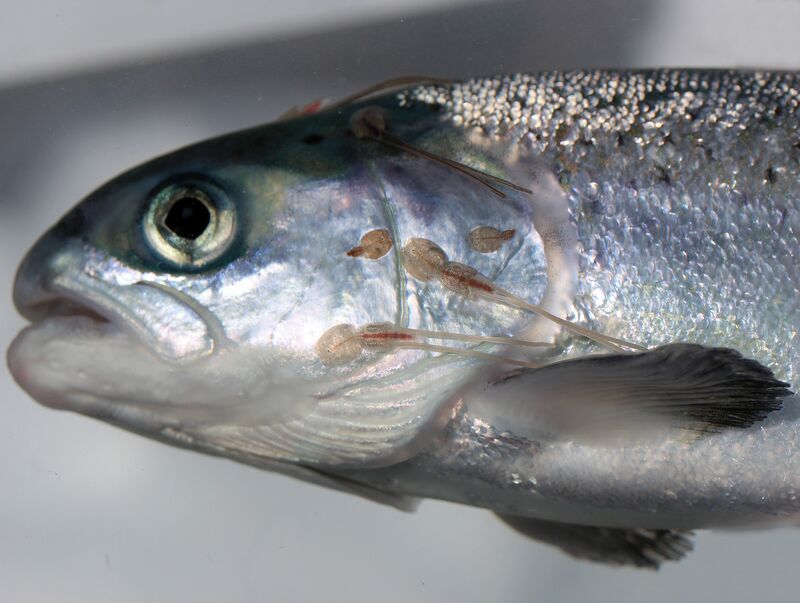 The salmon louse begins its life cycle when it hatches from the egg strings produced by the adult female louse, into free-living nauplia larvae. The development of the salmon louse is temperature dependent and after five days, at 10°C, the nauplia goes through extensive morphological changes and molts into the copepodid, the infective stage. (Fig. Copepodid). The free-living larva carries a pouch of food reserve of yolk proteins and fat that enables it to survive for about 12 days while locating a host. When the free-living copepodid makes contact with its host, it moves to a preferred location on the host before it attaches itself with a pair of small hooks called the second antennae. From the moment the copepodid is attached to the host it has become a parasite and is strictly dependent on the host for the rest of its life. Before the copepodid molts to its next developmental stage, the chalimus stage (Fig. Salmon louse life cyclex), it produces a short frontal filament that is glued to the host. In this way, the louse does not fall off when it changes its exoskeleton in order to grow. In the chalimus II stage, differentiation between female and male louse is for the first time microscopic possible. The female louse has a slightly larger cephalothorax, the frontal body part, than the male lice at this stage, but macroscopic discrimination is not possible before the next stage.As the louse enters the next stage in its lifecycle, the first pre-adult stage, it can move freely on the host surface. It is in the mobile stages that the lice cause most harm to the host, both because of their increased size and because of the fact that they can feed from a bigger area. After the two pre-adult stages the lice become adult and ready to reproduce. The males grow faster than females and reach sexual maturity prior to the females and can be found paired up to pre-adult II females in order to be the first to fertilize a given female. This is called pre-copula. The female carries the offspring in a pair of long egg strings attached to her genital segment. The egg strings can be up to 50 mm long and can contain as much as 700 eggs per egg string. At 10°C, the female louse produces new egg strings every 10 days, which results in several thousands of offspring within a few months. How do the salmon louse grow? 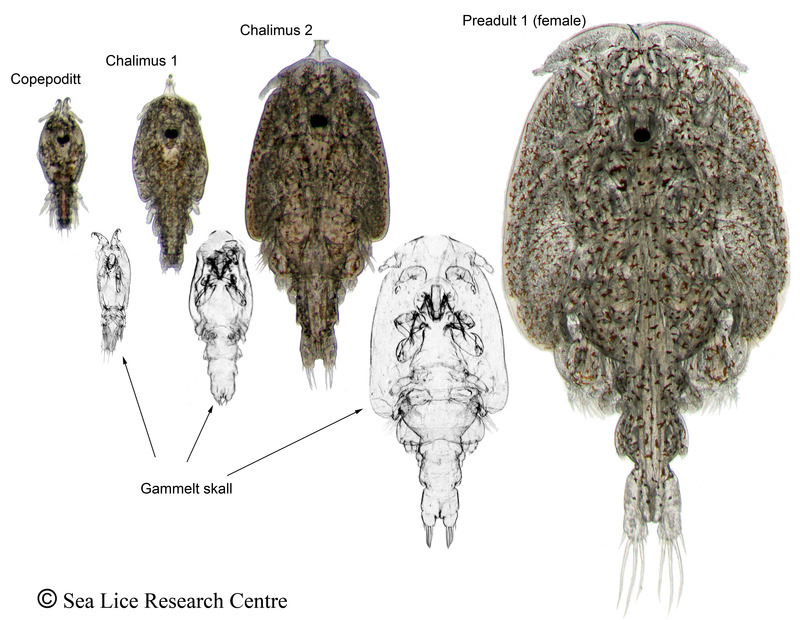 How are the salmon lice capable of finding the right host? It is not fully understood how the lice are capable of finding the right host, but it is known that both the nauplia and the copepodid seeks towards the light in the upper level of the water column (positive phototaxis). In addition, the lice larvae will avoid water with reduced salinity. This strategy increases their chances of meeting a potential host as the salmonid fishes are found in the same area. The free-living copepodid is also able to sense a pressure wave (through mechanoreceptors on the surface) in the water generated by a swimming fish. The copepodid reacts by swimming fast towards the fish and once attached, the copepodid will make the decision if this is the right host or not.